Continuing further His Highness says that the Master has allotted breaths to each individual by counts. 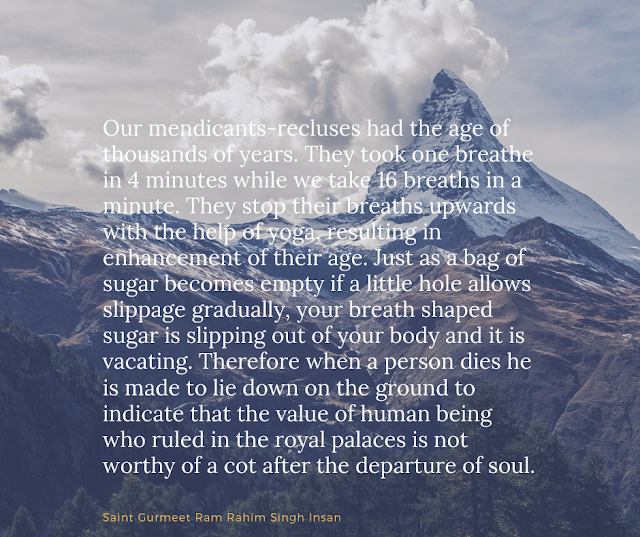 The time taken to consume those breaths becomes his life span. Generally, a person takes 17 or 18 breaths per minute. Suppose you have an age span of 100 years. If you consume smack, charas, hemp, opium or ‘post’ etc then this count increases to 25-30 per minute. This way the age of a person remains half in balance and departs from this world earlier. Some people plead that the breaths also are speeded due to playing games and doing exercise etc. Are these breaths also reduced from the total quota? No, because finally, the count of breaths become about 15 in the end due to the body becoming energetic. The exercise makes life blissful and serene. His Holiness says further that our mendicants-recluses like Lomas, Markadey etc had the age of thousands of years. It was due to this reason that they took one breathe in 4 minutes while we take 16 breaths in a minute. Some persons stop their breaths upwards with the help of yoga-concentration activities, resulting in enhancement of their age. So brother! Your breaths are reducing. Time is reducing just as a bag of sugar becomes empty if a little hole allows slippage gradually. Similarly your breathe shaped sugar is slipping out of your body and it is vacating. Therefore when a person dies he is made to lie down on the ground and not upon a cot. The placement on the ground is perhaps an indication that the value of human being who ruled in the royal palaces is not worthy of a cot after the departure of the soul. Respected Guru Ji Baba Ram Rahim Ji says further that time is passing moment by moment. Time honors those who pay regard to the time, while it shuns those who despise the time. Such persons become distant from the Master. Hence please pay due attention to the time. Time never waits and stops for anyone. It is always on the move. His Reverend says further that man can not become capable to earn the glimpse of the Master so far as you do not act upon the sermons of saints. Please pay attention to the sumrin-social service as far as possible by shunning ostentatious display. The circuit of Karmas is very complex, but it can be cut through Ram Naam. There is no other alternative for this. Therefore go on practicing sumrin. Mind and Maya go on looting the wealth of breaths and man remains wandering in transmigration. Therefore one must search for a Guru, who may tell him the truth without charging anything in lieu and may tell him Ram Naam. Who may work for the sake of humanity only? Such Peer-Faquirs must be searched for Sat sang may be listened and followed to receive happiness of both the worlds says the Reverend Baba Ram Rahim Ji.